When people in Salem, and any other British territory around the world, went to bed last night in 1752 it was September 2, but when they woke up this morning it was September 14: they “lost” eleven days as Great Britain and its colonies made the big switch from the Julian to the Gregorian Calendar, at long last. The latter was introduced by Pope Gregory XIII in 1582 in the midst of the religious conflict that followed in the wake of the Reformation; Queen Elizabeth had been excommunicated and declared a heretic by his predecessor: there was no way her Godly country would accept such a papal imposition. While other Protestant countries accepted the new calendar within decades, Britain held out for nearly two centuries. 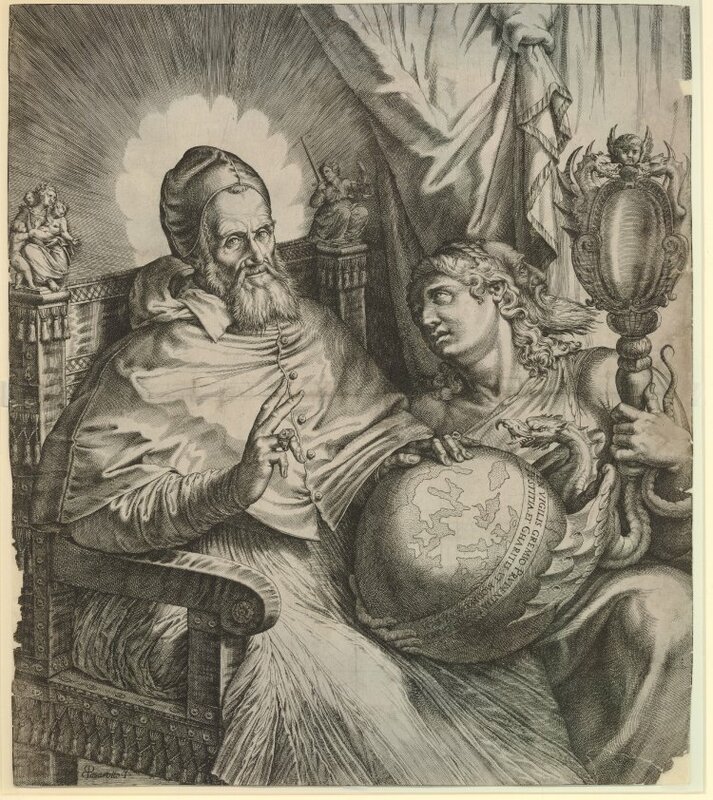 Engraving of Pop Gregory XIII after Bartolomeo Passarotti, 1572, and print by Pieter van der Heyden of Queen Elizabeth as Diana, judging Pope Gregory as Calisto, c. 1584, British Museum, London. Religious fervor had subsided considerably by the eighteenth century, if not before. 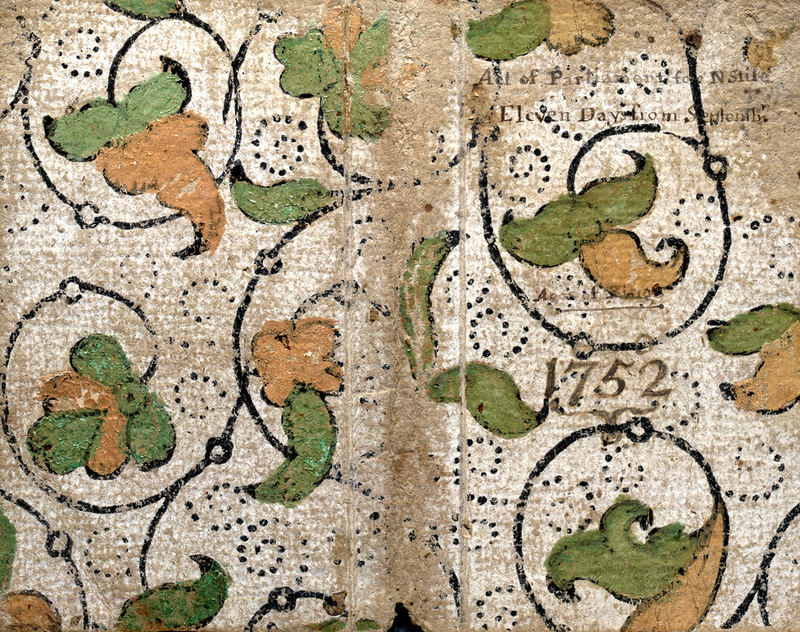 The conduct of both international and Great British commerce made the “Old Style” calendar inconvenient, and so Parliament passed the Calendar Act of 1750, commencing two years of transition to the “New Style” calendar: the year 1751 commenced on 25 March, the Julian New Year, and ran until 31 December, while 1752 began on January I, but sliced off the eleven September days to align the British calendar with that of the Continent. Two short years, and then the British Empire was part of the uniform calendar world. Despite the placement of a “given us our eleven days” placard in Hogarth’s Election Entertainment (1755) there does not seem to have been much resistance in Britain, and even less over here as gazetteers carefully explained the big change. Nathaniel Ames, author of An Astronomical Diary; or Almanack for the Year of our Lord Christ, 1752 devoted his last few pages to explaining that the “striking off the Eleven Days between the 2d and 14th of September, A.D. 1752 was effected “to produce an Uniformity in the Computation of Time throughout the christian Part of the World…”, and the Boston Gazette, the Virginia Almanack, and Benjamin Franklin’s Poor Richard’s Almanack included explanations and references to the Act of Parliament that had, quite literally, cut their time short. 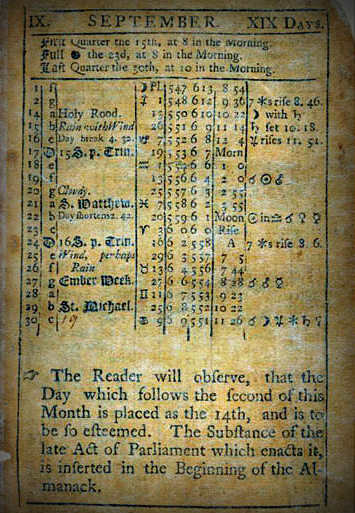 Virginia Almanack page for September 1752 and 1752 cover of Poor Richard’s Almanack, Rosenbach Museum & Library, Philadelphia; The modern calendar: Kate Greenaway’s almanac page for 1888–and 2013, New York Public Library Digital Gallery. 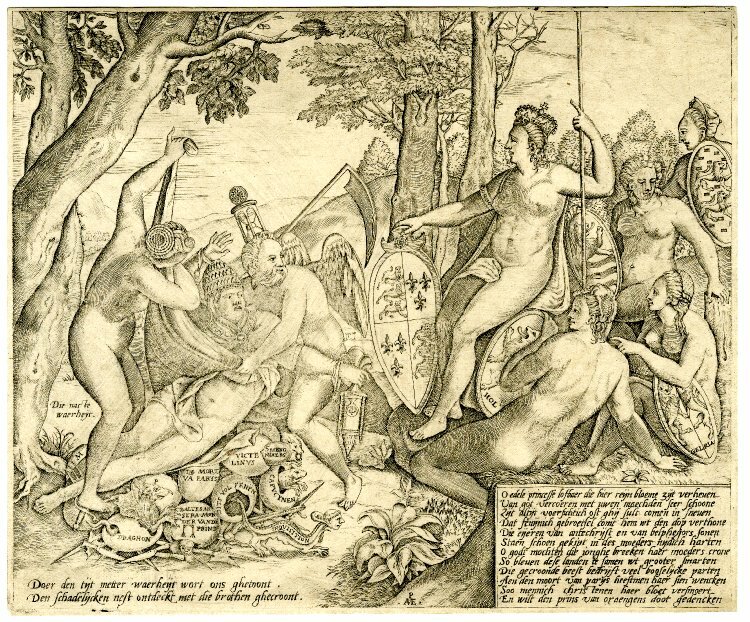 This entry was posted on Saturday, September 14th, 2013 at 7:53 am	and tagged with Art, British Empire, Elizabeth I, England, ephemera, Seasons and posted in Culture, History, Salem. You can follow any responses to this entry through the RSS 2.0 feed. The change is obvious in the page from Poor Richard’s Almanack, but I can’t discern how the “lost” 11 days were accounted for in the last image. 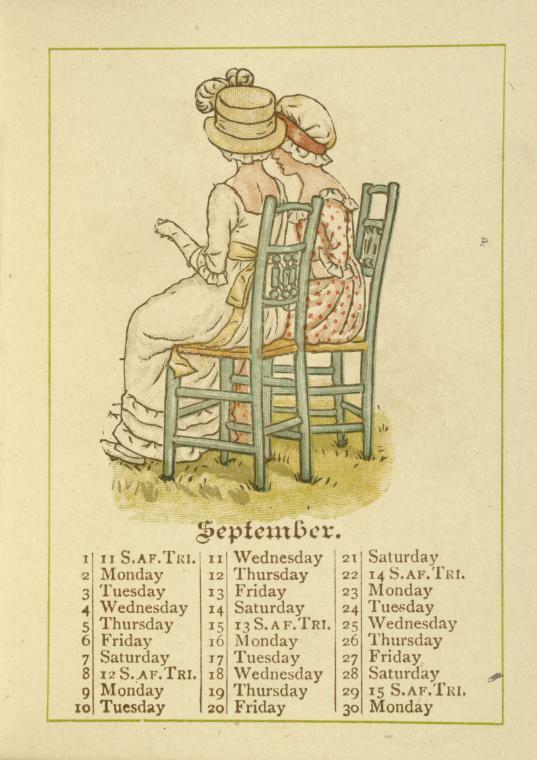 Oh that’s a modern calendar–Kate Greenaway’s from 1888, which is the same for September 2013. I try to insert Kate whenever I can, even if she doesn’t quite fit. Hello Cecilia–I’ve got to catch up with you and the farm soon! Not everyone appreciated losing 11 days. Rents were often paid on Lady Day, March 25, and since no one wanted to pay rent for a short year, the payment day shifted to what became known as Old Lady Day, now April 6. Thanks, Brian—what resistance there was does seem to be tied to economic fears, for lost rents and salaries. Love this explanation of Old Lady Day! In the navy, we crossed the international date line, and my friend had his birthday skipped. He said “the Navy took away my birthday”. Many people had that situation in your article. Also I remember within the past few years, a Pacific island moved it’s time zone from one side of the date line to the other. They lost a Friday! I would have planned it so they lost a Monday.